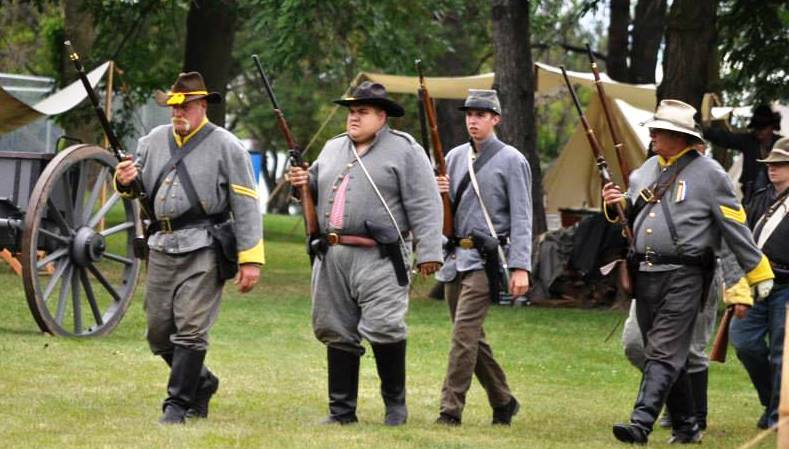 CIVIL WAR REENACTMENTS? I THINK I’LL PASS. I may have watched my last Civil-War reenactment. We’ll see. It’s not like giving up re-enactments will leave a gaping void in my life. I only saw my first one a year ago. By that time I’d been teaching and writing on the American Civil War for over a quarter of a century, so it may seem strange that I waited so long. Candidly, I was always skeptical. The American poet Walt Whitman, who observed the carnage of the Civil War firsthand, once famously observed that “the real war will never get in the books.” I was sure that he was right, and if a writer with the sensitivity and talent of a Whitman despaired of capturing the war’s horrific essence, I held out little hope for a bunch of middle-aged men playing pretend. I’m sure that sounds harsh, but that is how I viewed the matter. When I changed my mind and finally decided to attend a re-enactment, it was due to a combination of things: a book that I was using in a course that I was teaching here at Wheaton, the encouragement of several of my students, and a low-cost opportunity to check out a re-enactment close to my home. 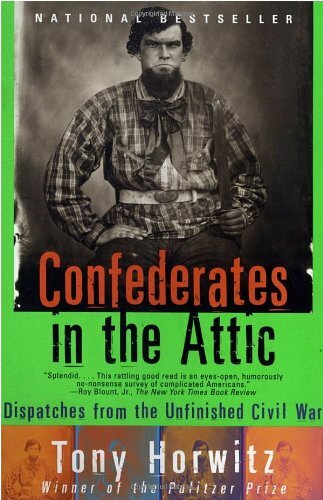 The book that influenced me was Tony Horwitz’s Confederates in the Attic: Dispatches from the Unfinished Civil War. If you haven’t read it, I highly recommend it. The book, which earned Horwitz a Pulitzer Prize, is one of those rare works that seems to appeal equally to academic specialists and general readers. The author, a New-York-born journalist with a decade of experience as a foreign correspondent in places like Bosnia, Iraq, and Northern Ireland, hit upon the idea of writing about an equally “foreign” locale much closer to home: the American South. As Horwitz tells the story, the idea came to him after he and his wife settled down in rural Virginia. One early morning they were awakened by Civil War re-enactors marching across a field near their house. (They were serving as extras in a historical documentary being filmed nearby.) Reporter that he is, Horwitz instinctively went to investigate, and in no time he had accepted an invitation to join the re-enactors on an upcoming camp-out. It was while he was sleeping out on the cold hard ground with these strangers, talking with them about why they were devoting their time and resources to such a hobby, that he hit upon the idea of spending a year or so traveling across the South, talking with people about how they remembered the Civil War and what it meant to them. Horwitz is a wonderful writer, and the encounters he relates are invariably entertaining. As a historian, what I value most about the book is how it drives home two critical points. The first concerns the absolutely fundamental distinction between history and the past. The past is dead and gone. History is the remembered past, and that’s a very different thing. Second, the history that informs how people live and think is rarely the history buried in academic tomes or lovingly preserved in historical archives. The history that makes the most difference in the world is the memory of the past that common folks carry around between their ears. Those memories often have almost nothing to do with the insights that professional historians spend their lives painstakingly producing. Indeed, if Horwitz is correct, they often have little to do with the actual past at all. I assigned Confederates in the Attic to my class on the American Civil War last fall, and when a major Civil-War reenactment was held less than a half-hour away within days of our discussing the book, I felt that I had to attend when some of my students invited me to accompany them. Since that time I’ve attended two more re-enactments in the Chicago area. I’d say that three is about my limit. Tony Horwitz approached Civil War reenactments as a reporter and was propelled by the reporters’ standard questions: who was doing what and why? I approached them not as a reporter but as a teacher, and so my questions were different: What do these staged historical dramas teach the crowds who come out to watch them? What, if anything, might they be expected to learn about the American Civil War from observing the spectacle? 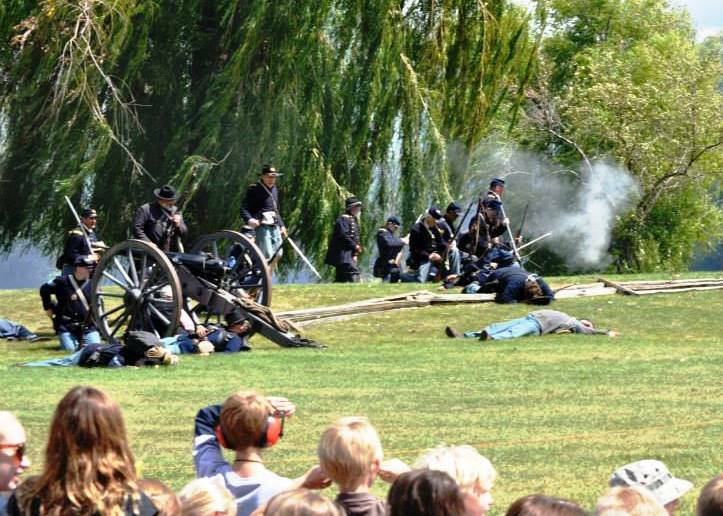 In sum, how do Civil-War re-enactments rate as teaching tools? To be honest, I’m still wrestling with an answer. What follows, then, is tentative, and I welcome your pushing back if I seem to be off-base. At any rate, here is how I think I would rate the educational value of the reenactments that I observed: Up until the shooting starts they’re not too bad. Once the mock battle begins, I have a lot of concerns. Let me explain. 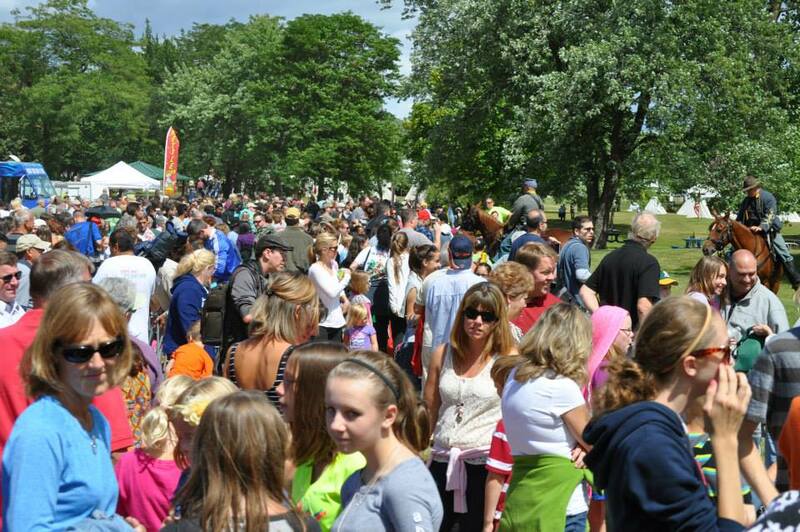 If this were the sum of the re-enactment demonstrations, I think I’d be OK with them. They aren’t accurate in every detail, but on balance I would say that the positives outweighed the negatives. But of course this isn’t everything. There’s always at least one mock battle every day of the re-enactment, sometimes two, and the mock battles trouble me–they trouble me a lot. As I said, I’m still working through this, but I’m inclined to think that they’re a huge mistake. “Lighten up,’ I can hear some of you thinking. “After all, until they start using live ammunition, who really thinks that a mock battle can adequately convey the horrors of war?” It can’t possibly, and that’s entirely my point. As a medium for teaching about war, the mock battle fails miserably. 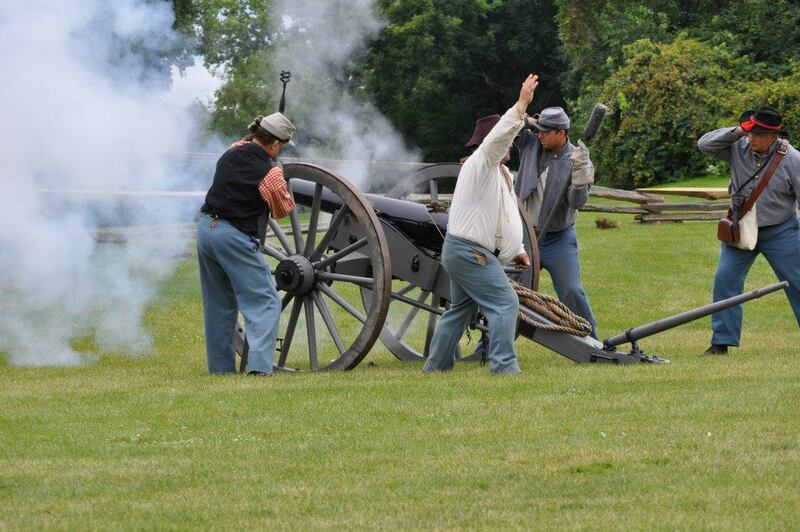 For my part, I say let re-enactors demonstrate how weapons are fired to their hearts’ content. Fire a cannon, and let the audience imagine what it would be like on the third day at Gettysburg to hear 150 such guns shake the earth at once. Have a company line up should to shoulder and fire their rifles in unison, and so help the audience to imagine the sheet of flame that poured forth from behind the stone wall at Fredericksburg. Just don’t let the re-enactors go through the grotesque charade of pretending to shoot at each other in a battle devoid of terror, agony, and blood. My thoughts began to run in this direction during my first reenactment. I was seated on the ground among a large audience of onlookers, many of whom had brought blankets and lawn chairs and looked for all the world like families at a youth league soccer match. For some time, the soldiers’ imaginary aim was apparently dreadful, for literally no one was falling on either side. (I guess after getting all dressed up and traveling a considerable distance to take part, it’s understandable that you wouldn’t want to get killed right away. Being “dead” must be pretty boring, after all.) Eventually, at the appointed time, the aim on both sides began to improve, and Billy Yanks and Johnny Rebs began to be hit with distressing frequency. Most fell quietly (and the middle-aged guys, at least, tended to fall pretty gently), but at one point in the show a Confederate soldier took an imaginary bullet and screamed out in mock pain before breathing his last. The audience laughed, and I began to wonder. Innocence is almost always a casualty of war. The loss of innocence can take many forms, visiting different people at different times in different ways. For northerners during the Civil War, the first widespread loss of innocence came on July 21st, 1861. The country faced a crisis of authority–no one doubted that–but the politicians and generals spoke in soothing tones, and those “in the know” predicted that the crisis would be resolved soon. As soon as the North showed those truculent southerners that they meant business, the Rebs would give up all talk of independence. Farm boys had rushed to enlist so as not to miss the one brief, glorious battle, while civilians in the vicinity flocked to Manassas Junction in order to witness the spectacle. Indeed, the cream of Washington society turned out on that sleepy Sunday, as the impending battle was the worst kept secret in the nation’s capital. They came down in their carriages–the ladies in their summer frocks and their escorts in their Sunday best. By one estimate their number included six U. S. Senators and ten or more members of the House of Representatives. These holiday-makers were there, in substantial numbers, because it never occurred to the authorities to keep them from coming. They were there because curiosity and the strange notion that war was an exciting pageant had led them to suppose that it might be stimulating to watch (from a safe seat in the gallery) while young men killed one another. They were there, in short, because America did not yet know what it was all about. But on that day at Bull Run, America began to learn. The casualties were staggering. They would appear modest in comparison with the war’s later battles, but there were at least 3,500 soldiers killed and wounded during the seven-hour conflict, enough to make it by far the bloodiest battle in American history to that point. To the mesmerized onlookers, the fighting was far enough away to seem endurable, until late in the afternoon when the Union line began to waver. But then the Yankee soldiers began slowly withdrawing from the field, and their civilian admirers watched nervously as the Confederate lines approached nearer. What began as a strategic withdrawal soon became a full-blown retreat, then the full-blown retreat became an every-man-for-himself rout, as panic-stricken soldiers raced across what moments earlier had been a picnic ground for politicians and their families. By the middle of the Civil War few Americans were still deceived enough to view the conflict as “an exciting pageant,” and spectacles like what happened at Bull Run would be seldom repeated. Although there are some things we can learn from watching Civil-War re-enactments, when it comes to striving to understand the experience of battle, there is no substitute for reading the thoughts and feelings of the soldiers themselves. 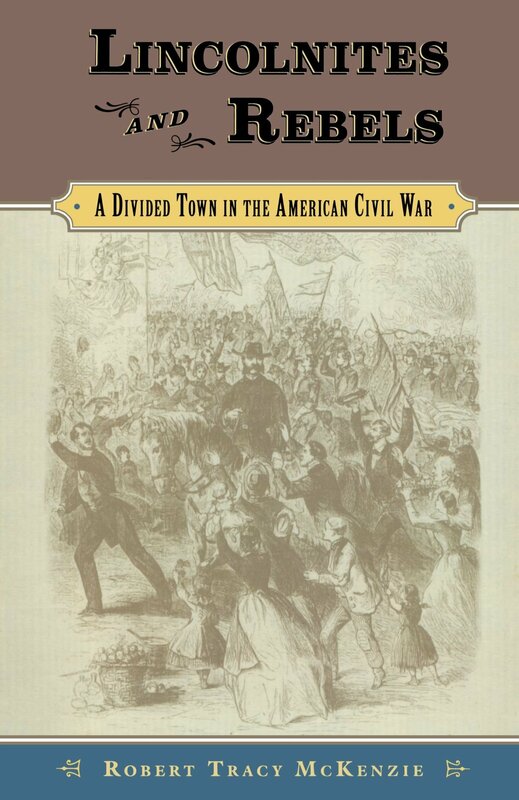 I am not a military historian by training, but I did have to read a great deal of soldiers’ letters and diaries when I was doing research for my book Lincolnites and Rebels: A Divided Town in the American Civil War (Oxford University Press, 2006). Lincolnites and Rebels is the story of Knoxville, Tennessee during the war. I chose to study Knoxville for two main reasons: it was almost perfectly divided between Confederate and Union sympathizers, and the town experienced military occupation by either the Union or Confederate army for all but three days of the war. I wanted to think through some of the moral issues related to loyalty under military occupation, and Knoxville seemed like the ideal place. But Knoxville was also the site of a major, but little studied Civil War battle. In November of 1863, while the town was occupied by a Union army of 12,000 men under the command of Major General Ambrose Burnside, 15,000 Confederates under General James Longstreet conducted a sixteen-day siege of the town. The siege of Knoxville culminated in a failed Confederate assault of the Union lines on November 29th, with most of the fighting focused on a supposedly vulnerable point in the Union defenses called Fort Sanders. The bulk of the fighting at the Battle of Fort Sanders lasted a scant twenty minutes. Longstreet’s orders required that his troops charge across an open field booby-trapped with telegraph wire and sharpened sticks, cross a deep ditch, and scale a twelve-foot-high earthen wall. The result was wholesale slaughter. During the flag of truce that followed, many of Fort Sanders’ defenders mounted the parapet to survey the carnage they had so recently helped to create. In his subsequent report on the battle, General Longstreet would reduce this vision of horror to a bloodless enumeration: Confederate losses, he informed Richmond, were 129 killed, 458 wounded, and 226 missing. That comes to 813 total casualties in roughly twenty minutes of fighting, or one casualty every second and a half. I don’t share all this because I am reflexively anti-war or a pacifist by principle. My grandfather served in the army in WWI. My father served in the navy in WWII. And if you happen to follow me on the highway, you’ll notice a decal in my rear window identifying me as the “Proud Parent of a U. S. Marine.” I share this because I am a historian and a teacher, and I don’t believe you can teach truly about war while covering up its horrors. Christian history. Some of you already may be tempted to stop reading. History, after all, is a subject that can often feel distant, boring, irrelevant. Fifth, Christian history inspires. I imagine you know what it’s like to hear a story or watch a film about a historical figure and feel stirred. Reading biographies can be a particularly powerful source of inspiration. Whether learning of the heavenly-mindedness of Jonathan Edwards, the persistence of Adoniram Judson, the faith of George Mueller, or the conviction of Martyn Lloyd-Jones, God has often used biographies in my life to encourage my soul and spark fresh devotion to Christ. . . . In Scripture, rehearsing acts of faith in the past (Hebrews 11:1-40) is tethered to running with endurance in the present (Hebrews 12:1-2). Your King intends yesterday’s stories to inspire you in today’s race. Finally, studying Christian history fires worship. How could it not? It deepens our amazement at God’s unflinching faithfulness through the ages. We’re moved to praise him for saving, for preserving, and for using his people despite themselves. Although Christian history is the study of the works of men and women, it’s ultimately the study of the work of God. It’s not Christians who have been building the church, after all; it’s Christ. I will build my church, he promised, and the gates of hell will not prevail against it (Matthew 16:18). Matt Smethurst serves as associate editor for The Gospel Coalition. He and his wife Maghan have two children and live in Louisville, Kentucky, where they belong to Third Avenue Baptist Church. You can follow him on Twitter. I have been away for far too long. Somehow, the beginning of a new school year always seems to catch me off guard, as if I didn’t see it coming. I have been struggling to get on top of things–trying to find the emotional and physical energy for the new year–and was also away for part of last week paying a visit to Little Rock, Arkansas. I was down there to tape an interview for “Family Life Today” on my book The First Thanksgiving: What the Real Story Tells Us about Loving God and Learning from History. It felt strange to be talking about Thanksgiving at the beginning of September, but I enjoyed the interview, and I also had the opportunity to experience some fine Arkansas cuisine–first at a restaurant named “Slim Chickens,” then at a swanky establishment called “The Whole Hog Cafe.” Great beans and cole slaw. At any rate, I’ve missed writing for you and hope to make more time for that from here on. To get back into the swing of things, I thought I would share a favorite quote from my commonplace book. My commonplace book is my “life thickener”–to use a phrase that I first heard from Mark Edmundson in his book Why Teach? Writing in it helps me to slow down and reflect on enduring questions of calling and purpose, questions that are immensely important but too easily crowded out by the demands of daily life. I like to re-read regularly the quotes that I have written down, especially at the beginning of each semester. In his book Life Together, Dietrich Bonhoeffer wrote that “the Christian needs another Christian who speaks God’s Word to him. He needs him again and again when he becomes uncertain and discouraged, for by himself he cannot help himself without belying the truth.” In a figurative sense, my commonplace book embodies something like what Bonhoeffer was describing. When I open its pages, I encounter numerous Christians who encourage me by reminding me of what is true. Below is an example from someone you probably haven’t heard of unless you are an academic historian. Arthur S. Link (1920-1998) was a long-time historian at Northwestern University and then at Princeton University, where he served for more than three decades. During his lifetime, he was widely recognized as the leading authority on the presidency of Woodrow Wilson. He edited Wilson’s personal papers and also authored a five-volume biography on the president. Overall, Link wrote some thirty books, and along the way he twice won the Bancroft Prize, which is essentially the “book-of-the-year” award given annually by the American Historical Association. In 1984 he received the highest honor that a U. S. historian can receive by being elected president of the that organization. Link was also a man of faith. In 1962, he wrote a piece for the journal Theology Today titled “The Historian’s Vocation.” As you read the excerpt below, try to imagine such a nationally prominent, Ivy League professor making a similar claim in 2014. In context, Link is reflecting on the difference that belief in God makes for the historian’s sense of vocation. The historian will no longer say with Descartes, “cogito, ergo sum” [“I think, therefore I am”]. He will now say “Deus est, ergo sum” [“God exists, therefore I am”], ergo creation, being, truth, history. Think what this means to the historian in so vital a matter as his methodology. It means that historical truth exists not in his imagination or because of his whim, but because God himself, the Creator of the universe, has brought human history into being and has himself lived in human history. Man, a finite creature, can know and understand truth only partially, imperfectly, corruptly, it may be. But by God’s grace he can at least honor, respect, and treasure it. That is to say, the historian, while readily acknowledging that only God knows all historical truth, can now affirm, profess, and confess that he stands in the presence of something far greater than himself, something that gives meaning to his life and work. P. S. In their book Resident Aliens, Stanley Hauerwas and William Willimon write that “Christians can survive only by supporting one another through the countless small acts through which we tell one another that we are not alone, that God is with us.” Thanks to the many of you who responded to my last post with kindness and encouragement. I appreciated it greatly.